Are you looking for a unique baby keepsake? 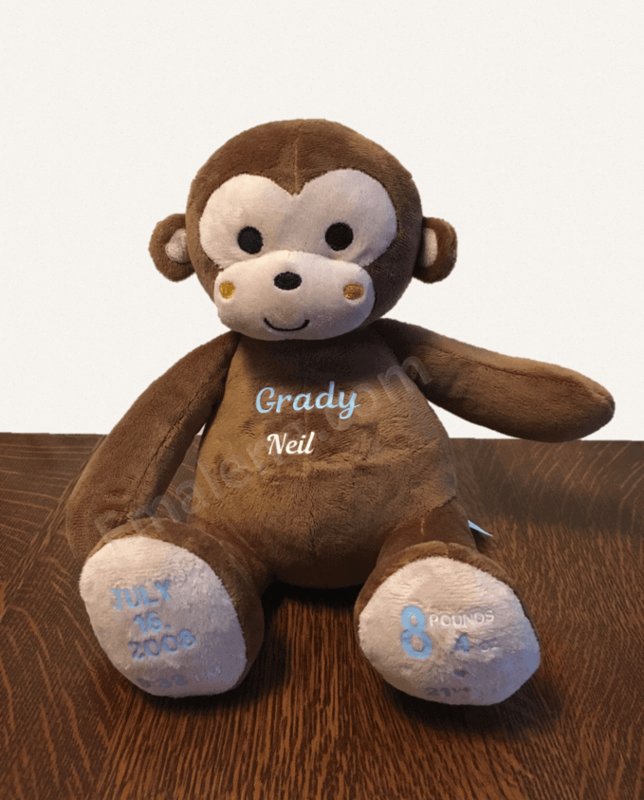 This stuffed monkey is personalized specifically for your baby with their name, date of birth, weight and length. Whether for a baby girl or baby boy, this monkey is a great baby keepsake gift. Are you looking for a unique baby keepsake? This stuffed monkey is personalized specifically for your baby with their name, date of birth, weight and length. Whether it is a baby girl or baby boy, this monkey is a great baby keepsake gift. This monkey measures approximately 8.5″ high with soft stitch eyes. Text is high quality heat transfer vinyl. Baby Name – Your preference of first, first and middle, first and last, etc. Due to size, I would recommend not more two. Girl or Boy – unless otherwise requested, girl will have pink text and boy will have blue text. If you would like a different color of text, please add that to the notes section as well. I cannot guarantee different colors but I will try and fulfill your request if possible. Special requests may incur a custom fee. All items are personalized at time of order. Please allow up to 2 weeks for delivery. We also offer a custom stuffed elephant. If you are interested, you can purchase it Stuffed Elephant. Emalene offers custom made products for your home. We love being able to provide decor to help make your home perfect for you. If you are looking for a specific item, please email us at julie@emalene.com to see if we can help with your design.